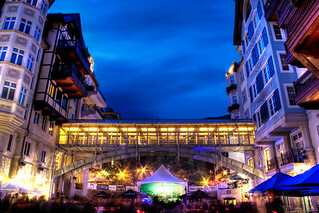 If you are thinking about heading to Vail, September can be a great time of year to go. Perfect weather for being outside and all sorts of things going on at night. In between days full of biking and hiking we ventured out to Lionshead Village to partake in the Annual Oktoberfest. This is a great street party with giant steins of beer and lots of great food and music. I also found out why Oktoberfest is held in September in most places. It is a party to celebrate the upcoming October harvest. Sort of a one last party. Well they throw a good one in Vail Colorado.